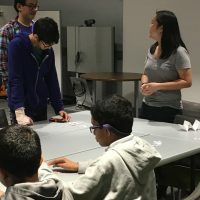 The Bay Area Teen Science Café program invites students in middle school and high school to come listen to scientific speakers, engage in interactive activities with them, and learn about a new field in science. Our program is special because of our location. Being located in the Bay Area, we have been offered amazing resources by the San Jose Tech Museum and we are able to invite speakers from top-tier universities such as Stanford. This allows our participants to make special connections with our speakers. 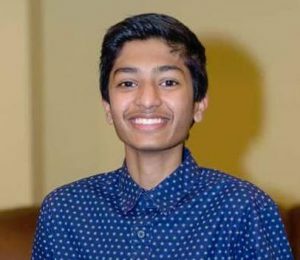 I am currently a senior at Monta Vista High School in Cupertino, and I became involved with my teen café program in my junior year. Research has always been a big passion of mine throughout high school, and I enjoy engaging in science when I can outside of the traditional textbook reading. That’s why I was motivated to start the Bay Area Teen Science Café program — to provide an outlet for students to express their interest in science and discover new areas in science by meeting researchers and innovators, not simply reading out of a textbook. By working with the two other co-founders, I was able to make this a reality. The San Jose Tech Museum provides a home for our teen café program. Our program fits in perfectly with the Tech Museum’s mission of increasing teen engagement in science activities and outreach. Our teen café program has brought many teens to the forefront of scientific advancement in a variety of areas. My favorite café was one done on dark matter, which took place in October of 2017. This café was especially interesting as we had never had a speaker talk on such a unique and upcoming subject, and we were able to align the café with the Tech Museum’s “dark” theme for Halloween. Additionally, the interactive activity, which participants built their own dark matter detector with basic materials, was incredible. What I like best about our program is how engaged the participants become and how the café can quickly change from a presentation-style to a conservation with the speaker continuously interacting with the participants. I also love it when the participants repeatedly ask questions, revealing that they are genuinely interested in the topic. My first piece of advice would be to find a couple of other people who are interested in the mission of teen cafés — this will make working with them much easier. After that, locating the right resources and organizations in your community is key. By planning and collaborating with them, you can start your own teen café as well. Just know that it may take time to find out what schedule/method works best for when you run your events. Stick with what works and try to fix areas that need improvement.